Combine the beef, onions and 505 Southwestern Chipotle Honey Roasted Chiles in a Lodge Logic 12" Cast Iron Skillet. Cook the beef all the way. Mix in the green onions. Season with salt. Set mixture aside. In a separate skillet, melt the butter, over medium heat. Add the flour, cumin, chipotles in adobo and Cattleman’s Grill Carne Asada and whisk constantly for about one minute. Slowly whisk in the beef stock. Once all of the stock is incorporated, add in the 505 Southwestern Enchilada Sauce. Season with salt. Keep sauce warm. Cover the bottom of a skillet with oil (grape seed is best). Fry each corn tortilla on both sides, until lightly browned, and just slightly crispy. Immediately, transfer the tortilla to the warm sauce. 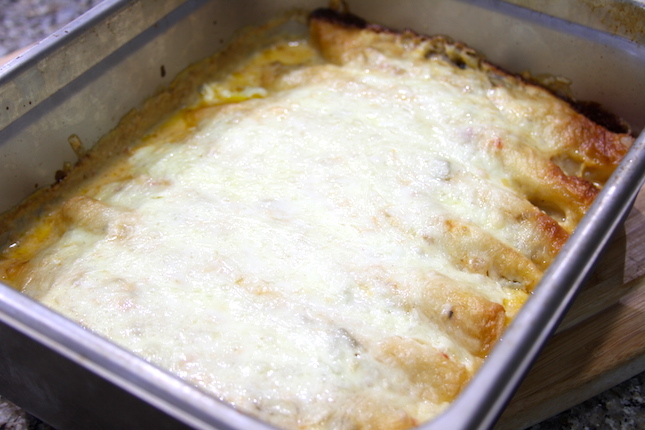 Dip the tortilla entirely with tongs, then set aside on a sheet pan. Repeat this process until all tortillas are fried and soaked in sauce. 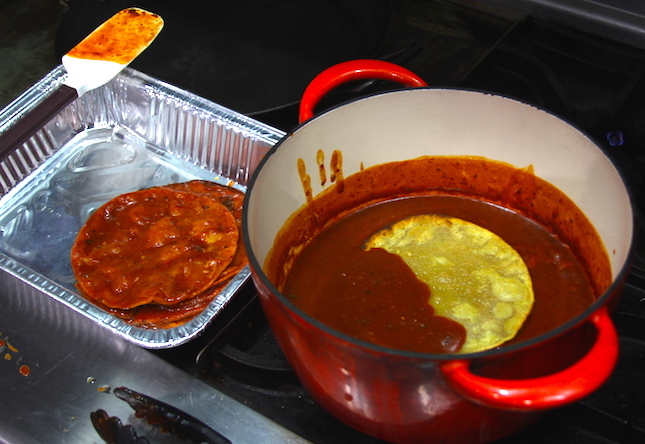 Cover the bottom of a half sized aluminum foil steam table pan (12.75” X 10.3”) with the enchilada sauce. Lay out a layer of 4 tortillas. 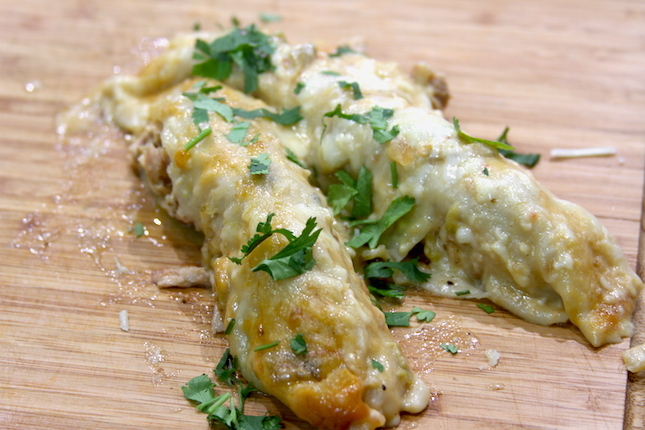 Cover tortillas with one third of your beef mixture, then one third of your cheese. Repeat this process until you’ve used all the ingredients. Bake in your Yoder Smokers YS640 at 400ºF, until the top is lightly browned, about 40 minutes. Cut out the backbone of the chicken and press flat. Place in a large zip top bag with the Sweetwater Spice Jalapeño Lime Fajita Bath. Brine according to directions on the jar. Remove chicken from the brine. Preheat your Yoder Smokers YS640 Pellet Smoker to 350ºF. Season under the skin of the chicken with Chili Dawgs Green Chile Seasoning. Place the chicken on a foil lined sheet pan, and cook until internal temperature reaches 165ºF (check the temperature using an instant read thermometer like the Maverick PT-100), about one hour. Meanwhile, warm a Lodge Logic 12" Cast Iron Skillet over medium heat. Melt the butter. Add the flour, cumin, oregano and Cattleman’s Grill Carne Asada Seasoning. Whisk constantly for about one minute. Slowly add the chicken stock. Then add the 505 Southwestern Green Chile Sauce. Remove from heat. Whisk in the sour cream. When the chicken is done, turn the cooker up to 400ºF, then separate the bones from the meat. Discard the bones. Tip: use cotton gloves under Summit Glove Tracers Nitrile food handling gloves to pull the chicken meat while hot. Shred the meat by hand, or with forks. Incorporate it with any remaining liquids from the sheet pan. Cover the bottom of a half sized aluminum foil steam table pan (12.75” X 10.3”) with the sauce. 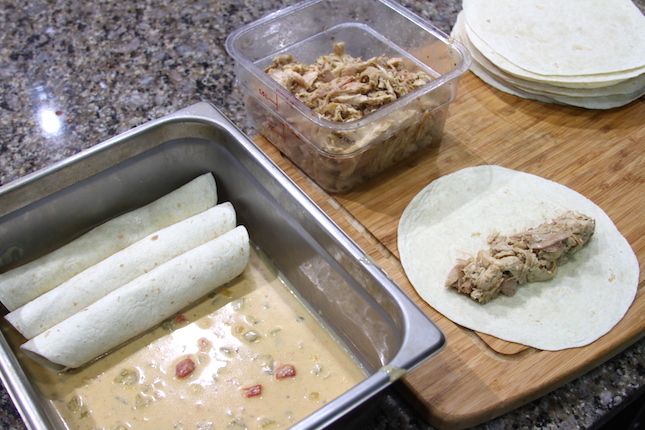 Roll the chicken in a tortilla, then place seam side down in the pan. Repeat until pan is full. 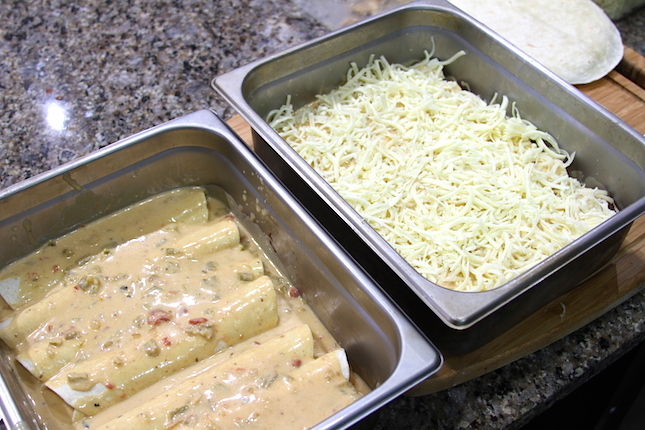 Pour the remaining sauce over the tops of the enchiladas. Sprinkle the cheese over the top. Bake at 400ºF for about an hour, until top begins to brown.